Spring breezes seem to whisper around every corner and here in the Pacific Northwest, Cherry Trees are sneaking about, ready to burst open while some are in full bloom with the Plum and Apple following closely behind. Yesterday, I saw a field of daffodils in full bloom, standing sturdily against the playful breeze. Yes, indeed I thought spring is just around the corner! 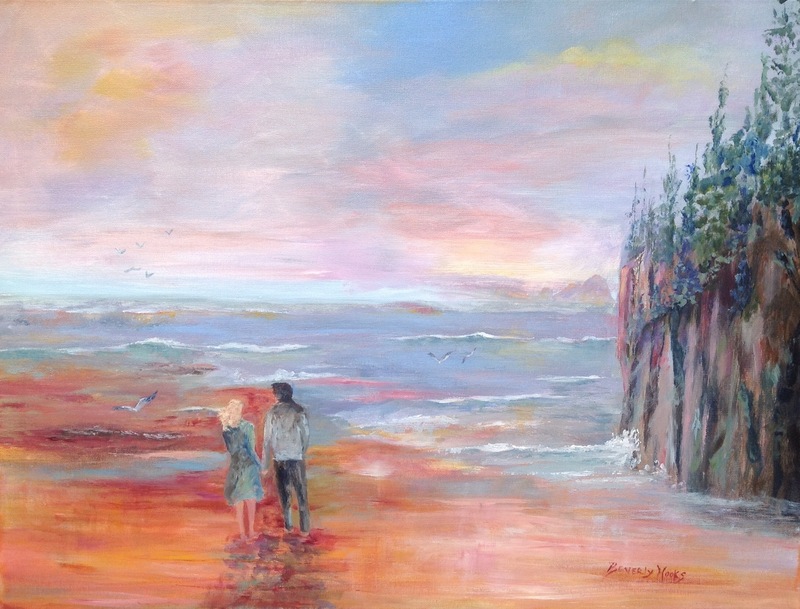 My new painting “Yesterday, Today and Forever”, is reminiscent of love in all time. Take your love by the hand and walk into the sunset as you visit my new work. Why does spring draw us nearer to the one we love in our thoughts, words and deeds? Perhaps it is a refreshing of our spirit. Capture your treasured moments with a commissioned painting!